Se bin n't wiis, dy Romeinen! Publisher: Dargaud Benelux, Brussel, Belgium / Oberon, Haarlem, Netherlands. 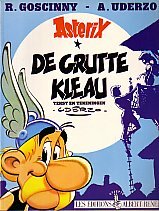 A nice detail is that the spelling has been changed after the first book: `un ferhaal fon Asterix de Goljer' has been replaced by `in ferhaal fan Asterix de Galjer'.